Everyone should learn how to make pickled red onions, or how they call them in Spanish, “Escabeche.” Have you ever tried them? 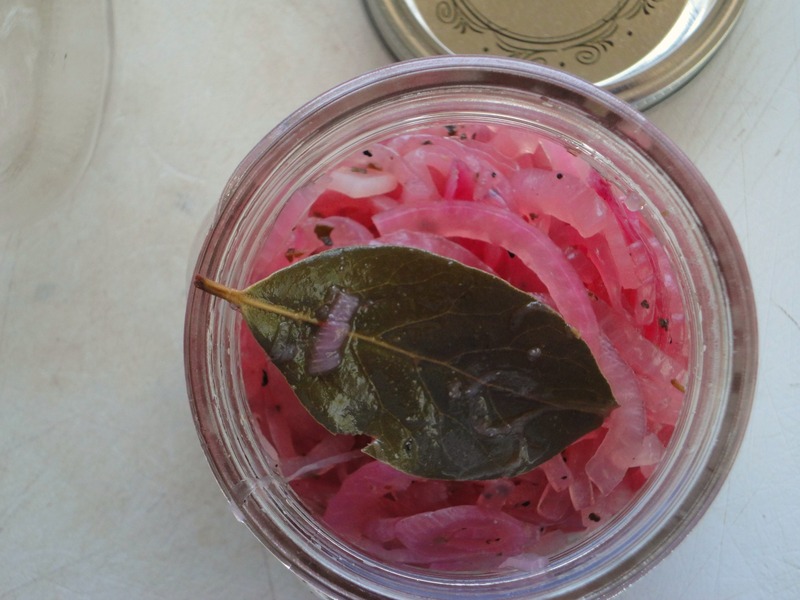 Go to your local taqueria and you’ll find these Yucatan-style pickled red onions. Magenta tinted, vinegary and slightly sweet, these pickled onions go with your tacos, tortas, enchiladas, huevos rancheros, quesadillas, carne asada, etc. I am not trying to diminish any cuisine to a single dish or ingredient, but tacos have emerged in the last few years as the sweethearts of food festivals all over the country. So learn it and you can impress the seniorit@s at your next summer bbq. Blanching the onions first may cut the bite, but it will also make them pliable. Boiling them for too long many diminish their color, so take care to keep the boil to a couple minutes. Do not overdo the variety of spices or you might not be able to distinguish any flavor, but be adventurous and try different herbs, spices, and even citrus zest. You can also use this same method to pickle chile peppers like jalapeños, serranos, and habaneros, or toss in a few sliced peppers along with the red onion escabeche. In the Yucatán, cebolla en escabeche is as common as bitter oranges. If you can get your hands on some bitter oranges, try substituting the juice for the vinegar for a more authentic taste. If you still want that citrus zing but cannot find bitter oranges, try substituting equal parts lime juice, orange juice, grapefruit juice, and vinegar. 1. Using a mandolin or a sharp knife, cut the onions into 1/8 inch thick half-moons. 2. In a heavy medium pot, combine the onions, water, garlic, salt and bay leaf. Bring to a boil over high heat. Once at a boil, only allow to boil for 2 minutes. 4. Return the onions, garlic and bay leaf to the same pot. Add the remaining ingredients and bring to a boil over medium heat. 5. Once at a boil, remove from heat and cover. Allow to cool for an hour. 6. Transfer the onion mixture to a jar (16 ounce jar should work fine) and close the jar and chill in the refrigerator. Allow to marinate for 2 hours or overnight. thanks for the recipe. i want to make it this weekend. What if I make it say on Friday and use it on Sunday? It will taste even better on Sunday because the flavors will have more time to develop as they meld together.